Review: All right, I’ll admit to being easily enamored by bombastic symphonic music that strives towards creating and instilling the feeling of an epic struggle within a given piece. There’s something about them that compels me to listen to those tracks over and over and despite all that, I never grow tired of them. 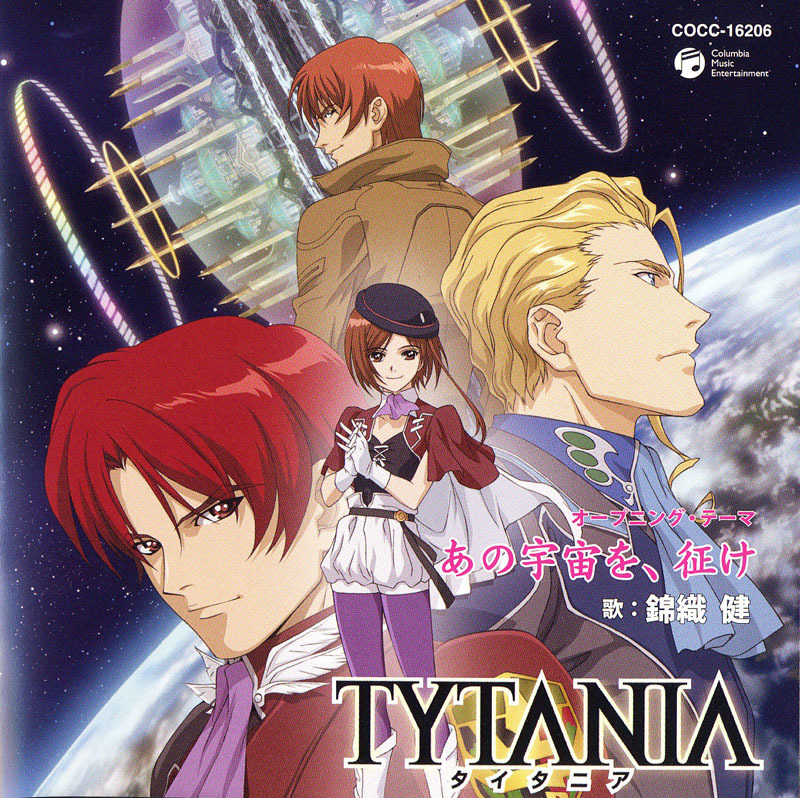 With that admission out of the way, “Ano Sora wo, Ike,” the opening theme to Tytania, delivers the bombast in spades and combined with Ken Nishikiori on vocals, the song effectively puts the opera back into the term “space opera.” From the sweeping opening theme, to the two BGM tracks that are included in this album, Ano Sora wo, Ike’s grandiosity succeeds at conveying the scope of the struggles and conflicts that make up Tytania’s plot. “Tytania [BGM]” starts off with a dominant imperial theme carried by the brass instruments that brings out the stifling sense of oppression brought about by Tytania’s hegemony over the galaxy. The melody conjures up the image of Tytania’s iron-fisted rule rather well, but you can tell that despite Tytania’s best efforts, the conflict that’s been brewing for some time is inevitable and manifests itself in a horn fanfare that begins around 0:25 as though to announce the great conflict through the crescendo at 0:41. This section is followed by a bittersweet violin melody that evokes the pain and misery of war as it paints a beautiful, but tragic picture of a crumbling empire, a picture further reinforced by the woodwinds which play a funeral dirge, mourning those whose lives have been thrown into disarray as a result of war. On the whole, the piece is fairly grim, though an inkling of hope pours forth as the opposition wishes to forge a lasting peace and freedom from Tytania, thereby setting the stage for Tytania’s plot. So while “Tytania [BGM]” paints a grim picture by evoking the tragedies that arise from the conflict, it’s up to “Ano Sora wo, Ike,” with Ken Nishikiori on vocals, to bring forth the glory to be had as a result of war. Nishikiori’s timbre is absolutely majestic and through his singing, you get a feel for the scope of the gigantic, monumental struggle that goes on in spite of the odds. Though you do hear a brief lament around the 1:02 mark, this song is largely inspirational, a mood that appears most prominently during the second verse. Here, the tempo speeds up slightly and the inclusion of the percussion creates a militaristic and regal feeling that is uplifting in the way it brings out a sense of heroism to be had on the field of battle. This feeling is punctuated by the trumpet fanfare at 2:24 as the grandiosity of the symphony flows through, culminating in a rousing finish that beckons the listener to go and prove their worth through glorious deeds. Finally, “Shouri [BGM]” closes out the album by taking “Ano Sora wo, Ike’s” rousing ending and transitioning that melody into a peaceful violin segment which signals at a new beginning. The horns that come in around 0:42 and the flutes at 0:51 add to the feeling of a rebirth now that the war is over and peace can finally take hold. The piece concludes on a very hopeful note, starting with the flute trill at 1:14 which leads to a regal theme that serves as an excellent introduction to the start of a new peaceful era. Taken in sum, Ano Sora wo, Ike’s tracks reads like a storybook. The first track has an uncertain, tragic aura about it as the gravity of the conflict sinks in, the second track feels like war is under way and glory seekers and heroic deeds aren’t in short supply as the war continues, and the last track feels like the war’s end as a peaceful era takes hold. Through these pieces, you really get a chance to feel the grand scale of the conflict and the melodies the tracks use to convey Tytania’s scope is absolutely majestic. If you’re a fan of operatic fanfares and symphonic works that aren’t subtle about trying to convey an epic atmosphere, Ano Sora wo, Ike is definitely worth your while. Ano Sora wo, Ike~! is certainly fresh for the anime music scene. I just love it too. Ano sora wo, Ike : didn’t know an opera-style song could be this epic. I love it. That pretty much nails the notion of the space opera quite well! Literally too! It’s something weird I noticed anyhow. And if you talk to me enough, you’ll know I have a penchant for weirdness.